Composite photograph of Roanoke store employees of Martha Washington Candies, Inc. Pictured are: Christine Bailey, Minnie Markham, Ethel Cecil, Evelyn Harris, Edith Bennett, Alberta Anderson, Patsy Bishop, Ruby Parsons, Frances Pace, Juanita Fisher, Ruth Booth, Eleanor Hobbs, Georgia Ingram, Irene Booth, Happy Scott, Sylvia Robinson, C.J. Marechal, W.B. Zollman, Lillian Pearson, Ruth Fielder, Mildred Wade, Moreland Bradford, Florence McCue, Athaleen Barnett, Mistie Sink, Ruth Sink, C.M. White, J.D. Logan Jr., Lucille Greenwood, Mayola Miller, Virginia Cundiff, Edith Patterson, Bernice Hoy, Grace Powers, Kathleen Elliott, Thelma Doss, Marie Black, Harry Whitehouse, S.T. 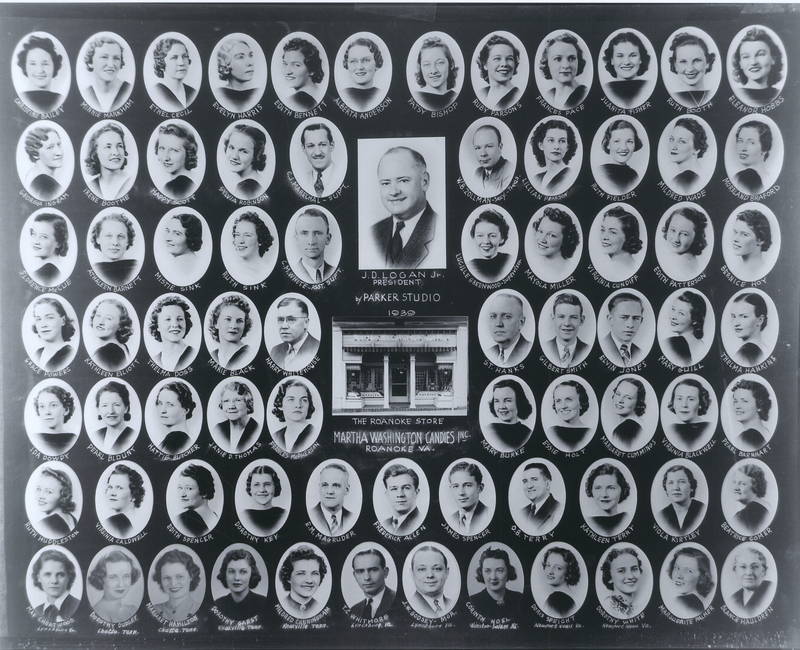 Hanks, Gilbert Smith, Elvin Jones, Mary Guill, Thelma Hankins, Ida Dowdy, Pearl Blount, Hattie Butcher, Janie Thomas, Frances McPherson, Mary Burke, Essie Holt, Margaret Cummings, Virginia Blackwell, Pearl Barnhart, Ruth Huddleston, Virginia Caldwell, Edith Spencer, Dorothy Key, E.M. Magruder, Frederick Allen, James Spencer, O.B. Terry, Kathleen Terry, Viola Kirtley, Beatrice Comer, Mae Cheatwood, Dorothy Dudley, Margaret Hamilton, Dorothy Garst, Mildred Cunningham, T.C. Whitmore, J.W. Godsey, Corinth Noel, Doris Speight, Dorothy White, Marguerite Palmer, and Blanche Hauldren. Parker Studio, “PS 274 MWC Employees,” Virginia Room Digital Collection, accessed April 19, 2019, http://www.virginiaroom.org/digital/document/PS274.